Before I married I had a very full spiritual life. I enjoyed Bible study and personal quiet time. I loved attending Bible school, church, and home group with my fiance. My first spiritual life shock came when we married. I thought when we lived together we would have much more time to spend in prayer and Bible study. But with both of us working evening shift, getting to bed late and housekeeping chores, we had to find new ways to keep up our spiritual disciplines. After almost three years of marriage we had settled into a good routine. It was not the same as before we were married, but we each had our quiet time and together we were developing spiritual closeness. Personal quiet time, Bible study, church services, and Christian music in our home went a long way to satisfying my hunger for more of God. I was totally unprepared for the drought I felt in my spiritual life once our longed for, prayed for, and prophesied baby was born. I had no idea how much time, strength, and chaos one little baby could cause! I loved that child with all my heart, but felt drained of any spirituality I had ever had. It took time and effort and flexibility to find I hadn’t lost God. Even more importantly, He had not abandoned me. Just because I couldn’t do my spiritual disciplines like I used to, didn’t mean I couldn’t continue my relationship with God. With the limited time and strength we have as moms, we need to learn the knack of practicing the presence of God. Remember that God is right there with us and cares deeply about the big and little matters of our daily lives. We have so many opportunities to commune with God! Pour out your heart as you go about your daily tasks and don’t forget that ‘quickie’ prayers are heard and answered by God too. Motherhood quickly and often gives us the opportunity to feel helpless. We don’t have the strength, wisdom, or experience to do the huge job of mothering each child we have. Our intense love for our children and the constantly changing needs of our kids bring us to our knees over and over again. God meets us in our humility and brokenness. There are precious promises in His Word for those who trust and rely on Him. Here are just two verses that can help us rely on God. Kelli wrote, “I remember a particular night, awake in a dark room, nursing my new baby. Admittedly in a haze of sleepy delirium, I had a slow spiritual epiphany: Like I was feeding my baby, God feeds me. God gives me life. God tenderly comforts me! In a deepened sense of understanding that’s hard to put into words, my view of God and how God relates to me shifted in that moment. I started to grasp that my own motherly love for my child was just a small glimpse of God’s parental love for me. In that moment, and in all the provisions of parenting since, I’ve been learning and relearning how much I, God’s child, am loved by my Maker who says to me, just as he said to Jerusalem, “As a mother comforts her child, so I will comfort you” (Isaiah 66:13). We must keep our eyes and hearts open to new and different ways to practice our spiritual disciplines. We can find new ways to pray and study our Bible, practice silence and be part of a community. Because of our children we may have opportunities to share our faith with other moms who have never attended church. In an article by Theresa Edwards, she asked, “Are you a toxic parent?” She had interviewed four mental health and relationship experts about parental behaviors that have the potential to damage their children and their relationship with their children. Now I don’t expect any of MY readers could be harming their children either directly or indirectly. But I’m sure I’m not the only one who worried that maybe I wasn’t parenting in the best way possible. Here are some ways you may be hurting your children or your relationship with your children. 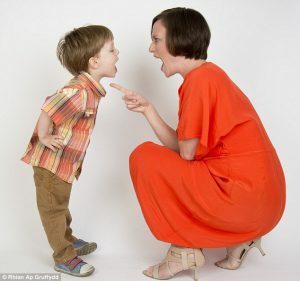 Yelling at your kids too much! I’ve had more than a few of you mention that you know you yell at your kids too much. If this is something you worry about, think about these things. Are you overwhelmed and out of control? What would it take to reduce your burdens so you have the reserves you need to deal with your children more calmly? Are you overtired? When was the last time you got enough sleep? How can you make this happen more regularly? Are you copying the parenting style you were raised with? Just because your parents’ yelled at you doesn’t mean you can’t learn a better way to communicate with your children. You express your fears to your kids! We may have a real fear of something we have not yet overcome. Fear becomes toxic when we model unreasonable fear or look to our children to help us deal with things that frighten us. We are the parents and need to find ways to deal with our fears. Passing our fears onto our children will hurt them in the long run. Some moms are terribly afraid of spiders. If they scream and run every time they encounter a spider, their children will likely adopt their own fear of spiders. If moms realize they are much bigger than the spiders and surely can hit them with something and kill them, their kids will learn there are good ways to overcome fear. Living Your Dreams and Aspirations Through Your Kids! Some parents try to get their kids to fulfill their unmet goals for themselves. Maybe they had to work as a shopkeeper when they really wanted to be a scientist. They push their children to take the science stream and to become the researcher they weren’t able to become. We should seek to know our kids’ strengths and weaknesses. We should give them opportunities to discover their own interests and desires. And as believers in Jesus, we should seek God’s will for our kids’ future. We need to allow our children to become the person God wants them to be not just the fulfillment of our dreams. Sometimes we just really can’t see that we are doing anything that will hurt our kids. If you see these indicators, you should look at the way you parent and take action to make some changes. Your kids say, “You never listen to me.” Are you taking the time to listen to your kids? Are you hearing more than their words to what is really bothering them? Your kids complain about the same thing repeatedly. Are you letting them know you are finding a way to deal with these concerns? You find yourself constantly blaming others for the upsets in your home. What part are you playing in these upsets? When you see your children behaving like you and you don’t like it. It is time to correct your own behavior before trying to deal with theirs. Our goal is to be the best parents we can be for the children we have. Most of the time we do quite well. But if you see you really are being “toxic” in one of these ways, seek help to make the needed changes. Don’t ignore these warning signs and don’t think they will improve on their own. It is not shameful to ask for help. It is shameful to know you need help and not to ask for it. Baby and children’s toys can really get expensive. Kids’ attention spans are short. So, trying to keep them in new and interesting toys can get to be a very expensive proposition. My goal for this newsletter is to provide you with some ideas for free or inexpensive ways to keep your kids playing and learning. These are not ‘babysitters,’ but rather ways families on a budget can still give their kids the advantage of stimulating creativity and learning. 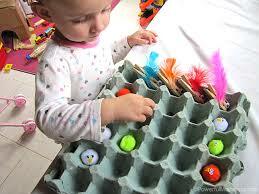 Choose a drawer or box that your little one can find new toys in every few days. If your drawer is in the kitchen, you may put a small pot and lid, plastic bowls that nest, a wire whisk, wooden spoons of different sizes, colored plastic cups, measuring spoons, chopsticks, a muffin pan, cookie cutters, etc. Keep changing what’s in there to keep them interested in exploring. A box in your sitting room may have a stuffed animal, a net ball, scraps of fabric with different textures, elastic and string, a small pillow, a picture book, a box of blocks or dominoes. Replace these with new things often. Make an obstacle course out of chairs, tables, sheets, and pillows for indoor fun. Take walks outside and use curbs for balance beams, stepping stones or cracks in pavement for agility in skipping, jumping, and hopping. Use sidewalk chalk to make a path that will challenge your child’s large muscle skills. 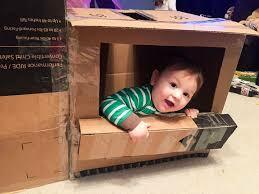 Kids love to make a fort out of old packing boxes. The boxes appliances come in are their favorites. Read a book to your little ones. They may want you to read one book every day for months or read a new book every day. Buying new books is good when your child is still putting everything they hold in their mouth, but as they get to be toddlers and preschoolers, you can use library books or used books. It is helpful if you can trade kids’ books with friends or play group buddies. eBooks are an option too, but don’t have the added benefit of teaching how to handle books nicely. Finger plays and action songs are a great way to teach pre-reading skills and cost nothing. Here are some great resources for these fun songs and rhymes. EarlyLiteracyLearning.org not only has a number of good songs and rhymes, but explains to you why and how to use these materials. If you cannot afford an expensive erector set, you can challenge your child’s building creativity with popsicle sticks, pipe cleaners, wooden clothes pegs, and rubber bands. You can keep a toddler busy with an empty water bottle and cut drinking straws or small pompoms to put in and pour out. Pompoms of different colors and sizes can be sorted, picked up with tongs and put into containers. For 70+ homemade toys you can make for your kids, see: Happy Hooligans Also, see my Pinterest board for Toys – Free or Inexpensive. For recipes for homemade foam, water beads, fizzy slush, pretend snow, colored melting ice, slime, sand foam and more, see my Pinterest board for sensory activities. For more on toys and the importance of play see: Toys and Play here at Your Child’s Journey. Please share your ideas by adding a comment to this post. Please take a minute or two to watch the short video. It is eye-opening! Who would you most like to eat dinner with? Did it surprise you as much as it did me? Research shows that as long as a child’s basic needs for food, clothing, shelter, and safety are provided, children want and need most the love and attention of their parents. Becky Mansfield at YourModernFamily.com said many of the children in her study wanted their parents to be less stressed and less tired. I think that is getting closer to the root of the problem. All of us love our children and want to give them our attention. But! That takes time and planning and concentration. When we have spent the day at a busy job, we’re tired and stressed. We don’t give our best attention when we are exhausted. Getting home, fixing dinner, making sure everyone has what they need for tomorrow makes us less gentle and patient with our kids. Get on a schedule. This takes some of the stress out of your day because you know what you need to do. Have your kids help with your chores. This lessens your load and teaches them valuable lessons. Get everything ready the night before to make mornings less hectic. Get a better start to your day. Limit your “online” time. If everyone limits their online time, there is more time to share together. Simplify your laundry and cooking chores. Get everyone involved to streamline the process. Laugh! Find ways to have FUN with your family. Read more from Becky on What do kids want most from their parents?